Noni can be taken internally in the form of juice or capsules, or used topically in the forms of lotion, or soap. Noni has a variety of uses. The results of many scientific studies support the belief that regular Noni use can help promote good health. 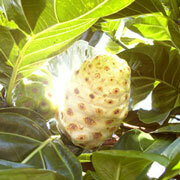 The Noni plant is a small evergreen tree that grows along Hawaii’s beaches and in forest areas up to 1,300 feet. It has been used for centuries by the Hawaiians to treat heart problems, diabetes, high blood pressure, arthritis, and other degenerative ailments. We do not make any claims that Noni cures diseases or ailments; however, people taking Noni on a consistent basis have experienced remarkable recoveries from various medical conditions. Noni grows throughout the South Pacific but Noni grown in Hawaii may be the purest and most potent variety in the world. Why? There is no pollution! NoniMaui is harvested and processed using the traditional Hawaiian methods. This insures “Grade A” 100% purity and potency. Much of the fruit offered by NoniMaui grows and is harvested from wild plants where no pesticides, herbicides or synthetic fertilizers have been used. They are the same plants that the Hawaiians planted long ago and used as medicine. The distant ancestors of today’s Polynesians are believed to have migrated to Hawaii from Southeast Asia. Several centuries before the time of Christ these sturdy and brave people set out upon great sea voyages in humble canoes arriving in the area of central Polynesia around the time of Christ, or approximately about 100 AD. Over the next several centuries the distinctive Polynesian culture emerged and was dispersed to all the islands now considered to constitute Polynesia which extends in an arc from New Zealand in the southwest to Hawaii in the northeast. Of the 12 most commonly mentioned plants (8 of which were brought from Southeast Asia) Noni was the second most popular plant mentioned for use in herbal remedies. When these first settlers began their journey into the unknown they took with them the plants and animals they considered to be essential for their survival in the new lands they sailed toward. Of the plants these settlers brought with them many had applications for clothing, building supplies, containers, dyes, etc., but most were primarily food and medicinal plants. Taro, yam, breadfruit, bananas and sugar cane are five of the Polynesian food plants that have origins in Southeast Asia. Of the twelve common Polynesian medicinal plants used by the Hawaiians, eight of the most popular plants are believed to have been brought to Hawaii from south and central Polynesia in a canoe voyages about 1,500 years ago. Although about 317 species of plants were believed to be employed by 19th century Hawaiians for herbal medicinal, only a very small number were commonly used for the most frequent health complaints. According to Dr. Isabella Abbott, of the University of Hawaii, Hawaiians that relied on herbal cures suffered from the same ailments that we, today, consider to be a part of modern every day life (with the notable exception of “headaches”). Before contact with the West (Captain Cook arrived in 1778) the isolated Hawaiians were relatively disease free. Their medical conditions addressed by herbal cures fell in the range of malignancies or tumors, purges or consumption, skin afflictions, respiratory affections (including asthma), indigestion, conditions associated with pregnancy, childbirth and old age, fever and bruises, broken bones, sprains and cuts. Contact with Captain Cook’s crews introduced gonorrhea, syphilis and tuberculosis, and continued contact in the 1800’s decimated the Hawaiian population with measles, small pox, cholera, mumps, influenza, pneumonia, leprosy and other diseases. The Hawaiian pharmacopoeia could not deal with these diseases, but the Western medicine had no cures for them either at that time. Noni, whose scientific name is Morinda citrifolia , and is also called Indian Mulberry was one of the important plants that were brought to Hawaii by the first Polynesians. One of the great tragedies of this devastation of the Hawaiian population was the loss of information in many areas of Hawaiian culture, including the area of herbal medicinal knowledge. The Hawaiian tradition required their men and women who held knowledge in all areas of Hawaiian society to chose an apprentice to pass that knowledge on to before they died. This was essential as most of their teachings and traditions were taught verbally. The epidemics brought by contact with the Western world swept through the Hawaiian peoples in a swift and deadly manner that allowed no time for the ancient knowledge of several thousands of years of civilization to be passed on. What little knowledge we have left to us today has come from the efforts of early historians who tried to capture in writing the details of practice and belief of the Hawaiians before the 1820’s, and the efforts of modern researchers to record the common knowledge of the older Hawaiians. Today, ancient Hawaiian medical knowledge is coming under the scrutiny of renewed interest spurred on by researchers in the fields of ethnobotany and ethnopharmacology. The call has gone out for systematic studies to determine pharmacologically active compounds among the Hawaiian plant medicinal. The need for these studies is underscored by the fact that today, in Western medicine, 60 per cent of written prescriptions are for substances that are naturally occurring in nature. The paucity of studies to date on Hawaiian medicinal herbs means that the “knowledge of the pharmacological properties of the majority of Hawaiian herbs is still incomplete” says Dr. Isabella Abbott of the University of Hawaii. Dr.’s Tabrah and Eveleth, in a report to the Hawaii Medical Journal, entitled Evaluation of the Effectiveness of Ancient Hawaiian Medicine, stated that the “Hawaiian Kahunas were highly specialized experts with considerable skill in physical diagnosis and pharmacology”. A “Kahuna” was a learned teacher of ancient body of spiritual, medical and philosophical knowledge called the Huna. Huna translates as “That Which is Hidden” and a Kahuna was simply a teacher of the Huna. The ancient Hawaiian knowledge of medicine was practiced by several different and distinct classes of Kahunas. The Hawaiians recognized two categories of disease. Those caused by forces from without the body, and those caused from forces within. The illnesses from within were treated by the kahuna haha (medical diagnostician), kahuna lapa`au (medical doctor) or the kahuna la`au lapa`au (herbalist). Noni, whose scientific name is Morinda citrifolia , and is also called Indian Mulberry was one of the important plants that were brought to Hawaii by the first Polynesians. Although, as mentioned before, there are 317 species of plants that were documented by Kaaiakamanu and Akina in 1922 to have been used by pre-20th century Hawaiian herbalists only a very small number were commonly used for known physical conditions of illnesses. Of the 12 most commonly mentioned plants (8 of which were brought from Southeast Asia) Noni was the second most popular plant mentioned for use in herbal remedies. Ethnobotanical studies from Indonesia verify many of the same uses for Noni as those reported by the Hawaiians. 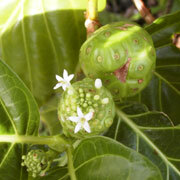 The Hawaiians utilized the whole Noni plant. The roots, stems, bark, leaves, flowers and fruit are all mentioned in various combinations in the almost 40 known and recorded herbal remedies involving Noni. In addition, the roots were used to produce a yellow or red dye for the tapa cloths, and the fruit was eaten during times of famine. There are numerous Polynesian stories of heroes and heroines that survived famine by eating the Noni. There is one tale of Kamapua`a, the pig god who loved Pele the volcano goddess, taunting Pele with the chant, I have seen the woman gathering Noni / Scratching Noni / Pounding Noni. Supposedly, the chant referred to Pele’s eyes which were red, and she became so angry she plunged into battle with him. A Tongan myth tells of the god Maui being restored to life by having the leaves of the Noni placed on his body. 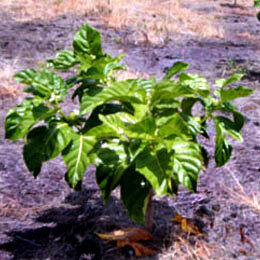 The Noni plant is a small evergreen tree found growing in open coastal regions at sea level and in forest areas up to about 1,300 feet above sea level. The plant is often found growing along lava flows. It’s identifiable by it’s straight trunk, large, bright green and elliptical leaves, white tubular flowers and it’s distinctive, ovid, “grenade-like” yellow fruit. The fruit can grow to 12cm or more and has a lumpy surface covered by polygonal-shaped sections. The seeds, which are triangular shaped and reddish brown, have an air-sac attached at one end which makes the seeds buoyant, (this could explain, in part, the wide distribution of the plant throughout the Hawaiian Islands). 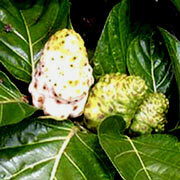 The Noni fruit, when mature, has a foul taste and odor. The smell and taste of the fruit pulp is so foul that one researcher pronounced it akin to ‘vomitus’! Although well know and popular in the islands, (the University of Hawaii’s Botany department receives about 10 calls a week from people trying to locate a source of Noni) this characteristic, until now, has been a definite barrier to it’s widespread use on the mainland. In 1992, Mr. Herbert Moniz, a licensed massage therapist and lifetime resident of Maui, developed a unique process to dehydrate the Noni fruit into a powder. Mr. Moniz learned about the Noni fruit and it’s believed medicinal value when a family friend recommended it to his wife, Lona, who was undergoing treatment for breast cancer. When Mrs. Moniz’s cancer did not recur, Mr. Moniz developed the process by which the Noni fruit is pulped, the seeded removed and saved for propagation of new plants, and the pulp then dried into powder form. In an article published in the Honolulu Advertiser on Feb. 9, 1992, Professor of Botany at the University of Hawaii, Isabella Abbott, was quoted as saying “People are crazy about this plant. They use it for diabetes, high blood pressure, cancer and many other illnesses.” Dr. Joseph Betz, a research chemist with the F.D.A.’s Division of Natural Products Center for Food Safety and Applied Nutrition states, “Morinda citrifolia has been tested for a number of biological activities in animal and anti-microbial studies.” He reports that the dried fruit has a smooth muscle stimulatory activity and a histaminergic effect. The root was also reported as possessing analgesic and tranquilizing activity. In the September 30, 1993 issue of Cancer Letters a report out of Keio University and The Institute of Biomedical Sciences in Japan claimed isolation of a new anthraquinone compound from the Noni root called damnacanthal which induced normal morphology and cytoskeletal structure in K-ras-NRK cancer cells. Todays’ researchers in the emerging fields of ethnobotony and ethnopharmacology are reaching back through time to discover again what the ancient Polynesians knew as they carefully, lovingly placed the young shoots of the valuable Noni plant into their canoes, among the bananas, taro and yams, and set out for horizons unknown. Almost nothing is known now about these early Hawaiians, how they worshiped and what they would talk about amongst themselves as they watched the brilliant tropical sun set, once again, into the vast and lonely ocean that kept them isolated from the rest of the world for almost 2,000 years. They’ve disappeared, the veil of time leaving us only hints of their lives, and the evergreen gift of the Noni. 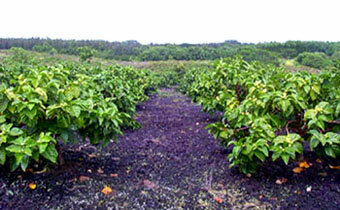 Noni Maui is harvested and processed using the traditional Hawaiian methods. This insures “Grade A” 100% purity and potency. Much of the fruit offered by NoniMaui grows and is harvested from wild plants where no pesticides, herbicides or synthetic fertilizers have been used. They are the same plants that the Hawaiians planted long ago and used as medicine.Hawaiian Noni products from Noni Maui consist of 100% pure Noni, not fillers such as seeds, stems, leaves, or bark. An independent laboratory study comparing our Hawaiian Noni juice to other leading brands of Noni has shown our Hawaiian Noni to contain a greater concentration of polysaccharides which are being investigated as the active compounds responsible for some of Noni’s proposed health effects. In addition to receiving a high quality Noni product, buying Hawaiian Noni helps support an alternative agricultural industry to help diversify the Hawaiian economy and preserve the natural landscape.